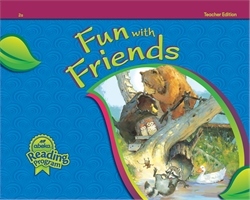 Read along with your students with your own copy of Fun with Friends. This hardcover, spiral-bound teacher’s companion includes a copy of the student book with added teaching helps for each story and exercise. Gr. 2. Goals and objectives teach you what to look for as your students read. More than just sounding out the words, your students will learn to read with expression, to observe punctuation, and to read for comprehension. Phonics Practice sections teach you the concepts to explain before your students read the story, preparing them for each new concept. Comprehension questions help you check that your students are reading for meaning. Character themes, discussion questions, and Scripture verses help your students apply the principles and godly character traits found in the story. Teaching helps are provided side by side with the page the student will be reading. As the teacher, you will know exactly what to do before, during, and after the story.